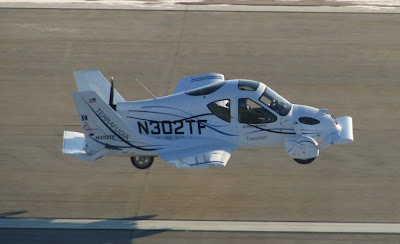 Worlds First Cool Flying Car - A cool car would be one that can also fly, yes? Well here it is! The world's first flying car. 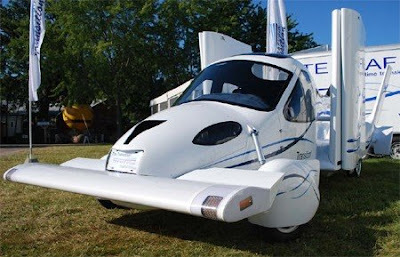 The Terrafugia Transition was developed by former Nasa engineers. The car is powered by a 100bhp engine, used on both the ground and in the air. The company is based in Massachusetts. 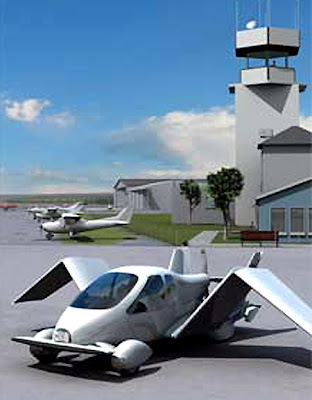 It can transform itself from a two-seater car on the road into a plane within, the makers say, 15 seconds. The manufacturers say the car will be able to fly up to 500 miles on a single tank of petrol. It reportedly has a cruising speed of 115mph. The car/plane is expected to go on sale to the public in about 18 months' time. Designer Car Dietrich says there are 40 orders in for the machine, which costs around £132,000 (approx $280,000). However, its makers insist that is still a good price for an aeroplane. Car Insurance or Plane Insurance...and take-off locations - it is generally illegal to take off from a road!